Prior to initiating change it is essential to consider the beliefs and behaviors that are ingrained in the company. Behaviors can be seen – beliefs can’t. This is most apparent in the behaviors of a company’s leadership, which everyone inside and outside the organization sees and monitors. If new leadership is put into place, he/she must behave as the company believes, not as they believe. Employees felt discouraged by the behaviors from leadership including cronyism in hiring practices, sexual harassment and off-color jokes. Needless to say, Zell failed to revive the company. A year after he took control he was forced to file for bankruptcy protection which lasted until 2012. Zell sold the company at a loss of $3.7 billion, and Tribune Co. continues to fight to get back on its feet. 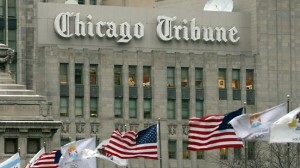 Will we ever know what would have happened if Tribune Co was placed under different leadership back in 2007? Check back next week for a part 2 post on behaviors and beliefs. To avoid a similar mistake and get a better understanding of what the people of your company are experiencing internally, we can help. Here’s a free trial of the Companies Are People, Too organizational assessment to find out your company’s personality. Tags: Behavior, Beleifs, cap2, Chicago Tribune, Companies are people too, Culture, Organizational Change, Tribune Co.